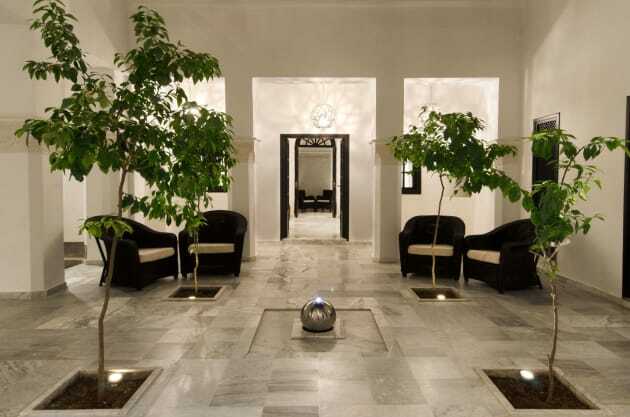 Offering an indoor pool and a spa and wellness centre, Riad Sapphire is located in Marrakech. Free Wi-Fi access is available. Featuring a bathtub with shower, all private bathrooms include a hairdryer and towels. A safety deposit box and linen are provided. At Riad Sapphire you will find a restaurant. Other facilities offered include a shared lounge, an ironing service and a laundry. Enjoy a meal at the restaurant or snacks in the coffee shop/café. The riad also offers 24-hour room service. A complimentary full breakfast is served daily from 8:00 AM to noon. 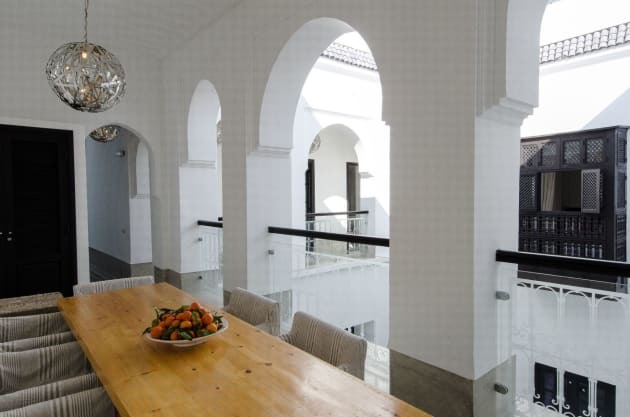 The hotel is ideally situated at the heart of the gigantic Medina of Marrakech, in the Bab Doukkala neighbourhood. This charming design establishment was completely restored in 2010 in accordance with an authentic Moroccan style, and offers a warm and traditional setting. Guests are welcomed in a lobby by a friendly staff, which is ready to assist with service and information. The hotel consists of a ground floor, including a common living room with a salon, TV and Internet access. It comprises a total of 5 rooms, each equipped with all modern comforts and decorated with taste and refinement in a contemporary style with an oriental touch. This magnificent hotel enjoys a great setting at the heart of Marrakech. The hotel is located just a few minutes' walking distance from Jemaa El Fna Square in the city, offering guests the perfect setting from which to explore the delights that the area has to offer. 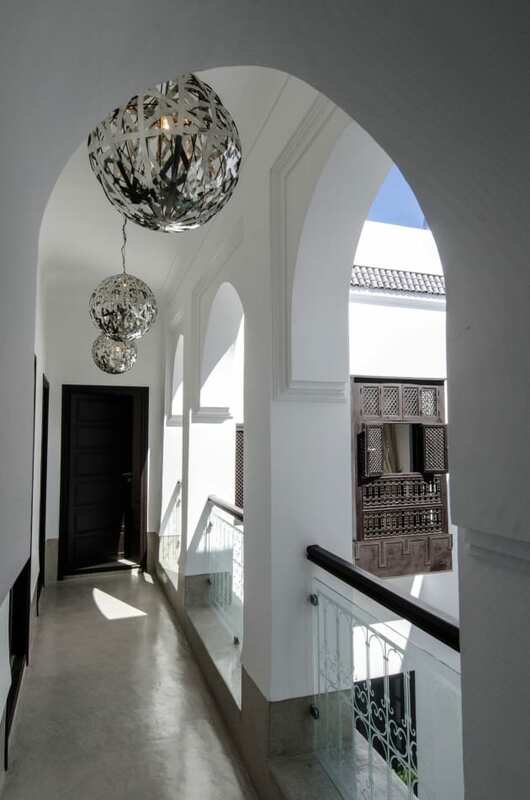 This superb hotel beautifully combines traditional, lavish Moroccan designs with contemporary influences. The interior is exquisitely appointed, showcasing the grace and beauty of traditional design. The guest rooms are superbly appointed, offering a cocoon of peace and serenity in which to indulge in the ultimate relaxation. Guests are invited to enjoy a wide range of exemplary facilities at this sublime hotel. Marrakech Riad Dar Zaman is a beautiful and cozy riad located in the heart of the impressive Marrakech medina in Morocco. Charismatic, romantic, chic and unforgettable, riad Dar Zaman has four gorgeous en-suite double bedrooms, a sun terrace, plunge pool, open fireplaces and a fun and lovely team to take care of you! Dar Zaman, which means “Old House” in Arabic, is an 18th century riad, the former family home of Marrakech merchants.Marrakech is a fantastic city – one of those place you must visit. 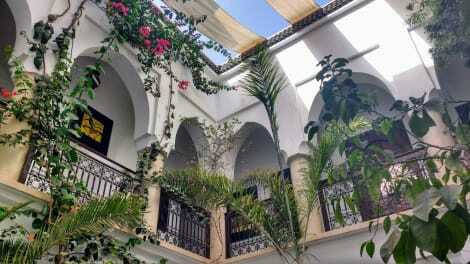 Make Riad Dar Zaman the place for your accommodation in Marrakech. We’re looking forward to seeing you soon! Riad Adika Guests checking into the luxury, 4x000D star Riad Adika in Marrakech are assured of a warm welcome. The hotel offers off site car parking. The hotel offers restaurant facilities. Business users are catered for with wifi and meeting facilities available at the Riad Adika. Rooms at the Riad Adika. All rooms have a hairdryer. Smoking in certain bedrooms is allowed, as well as in public areas of the hotel. Please specify when making your booking. Wifi internet access is available in all rooms. All rooms feature a stocked minibar. Leisure Info. Leisure facilities are available at the Riad Adika. A luxurious range of spa treatments including beauty, massage and sauna is available. Guests can relax in the hotels indoor swimming pool. Outdoor leisure activities available include mountain biking with our mountain bike hire and quad biking. Other Info. An airport shuttle service is available from the hotel. Pet owners and their well behaved pets are welcome at the hotel. A concierge service is available to guests. The hotel has disabled facilities with wheelchair access to the hotel, reception, restaurant, bar and disabled car parking spaces areas of the hotel. Satisfy your appetite for lunch or dinner at the riad's restaurant, or stay in and take advantage of the room service (during limited hours). A complimentary continental breakfast is served daily from 8 AM to 11 AM.